What did the Harappa people eat? From what flowers/minerals did they get their pigments from? Large ladle found with burial pottery in a disturbed Harappan cemetery. 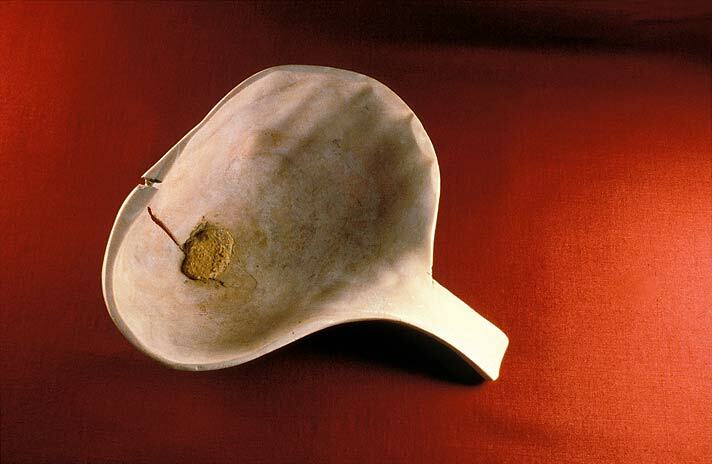 Shell ladles were probably used in special rituals for dispensing sacred liquids such as water or oil. A hole in the bottom of the ladle has been repaired with a lead rivet. Corrosion and expansion of the lead has caused the shell to crack. The Harappans in the urban period had a varied diet principally based on wheat, barley, millets and cattle, sheep and goat. In my book, Ancient Indus: Urbanism, Economy and Society, there are two chapters that list these different foods. These are Chapters 6 and 7. My answer is based on the result of the research of Steven Weber our paleobotanist sometimes called archaeobotanist. Pigments for ceramic production are principally iron oxide pigments, which are easily procured. The other is manganese oxides to produce blacks. The iron oxide pigments were used for red and black; to produce black you need to place the pots in a reducing atmosphere, an alternating oxygen/reduction (no air) atmospheres. With the manganese you can achieve black in an oxidizing atmosphere. Again, you can read a bit about this in my chapters 6 and 7.